$11K IN OPTIONS! 1-OWNER! $4,328 BELOW KBB! CLEAN CARFAX! FULL FACTORY WARRANTY! WE CAN DELIVER THIS PORSCHE CAYMAN TO ANY DRIVEWAY IN THE COUNTRY! VISIT OUR WEBSITE AT WWW.SHOPRIGHTCHOICE.COM TO SEE 84 PHOTOS, THE FREE CARFAX, AND MORE INFO ON THIS INCREDIBLE DEAL! 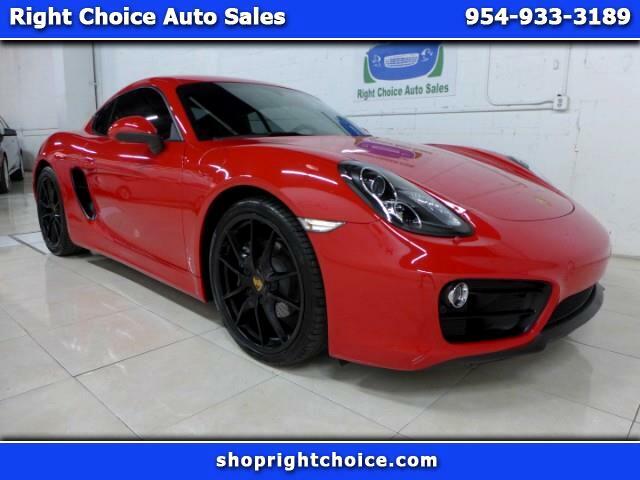 THIS 1-OWNER CAYMAN LOOKS AND DRIVES LIKE IT'S BRAND NEW, HAS A CLEAN CARFAX (NO ACCIDENTS OR DAMAGE), $11K IN OPTIONS, 28K MILES OF FULL FACTORY WARRANTY REMAINING, METICULOUSLY WELL MAINTAINED WITH 11 SERVICE RECORDS, IS A GARAGE-KEPT FLORIDA CAR, AND IS PRICED $4,328 BELOW THE KELLEY BLUE BOOK TYPICAL LISTING PRICE! DO NOT MISS THIS DEAL!